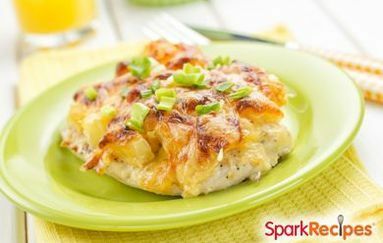 Using skinless chicken breasts means this tangy dish is lower in saturated fat and cholesterol. You can also use chicken thighs and drumsticks. 1. Place chicken in 13x9x2" glass baking dish. 2. Mix lemon juice, vinegar, lemon peel, oregano, and onions. Pour over chicken, cover and marinate in refrigerator several hours or overnight, turning occasionally. 4. Cover and bake at 325º F for 30 minutes. Uncover and bake 30 minutes more or until done.